This week Ireland’s under-17 manager Tom Mohan named his squad for the upcoming UEFA Championship finals in Bulgaria next month, with four DB Sports Tours players named in the squad. 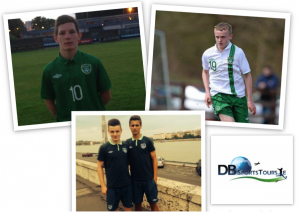 Darragh Leahy, Trevor Clarke, Zac Elbouzedi and Jonathan Lunney – all in association with DB Sports Tours, have been named in the squad for the upcoming under-17 UEFA Championships which kicks off on May 6th – the 7th for Ireland, with their opening game coming up against The Netherlands. The Championships represent the next big step in the careers of these four young men, who have had a whirlwind of change in their lives over the past 18 months. Darragh Leahy, for example, signed a two year deal with Coventry City earlier in the year, which has seen his stature – and ability – go on a fine ascendancy. Trevor Clarke is Leahy’s old team mate at St. Kevin’s Boys and Clarke’s résumé is as extensive as it is impressive; not only has he won three All Irelands, two League Cups and a DDSL premier title as well as a host of International caps. Ex-Malahide FC player Zachary Elbouzedi, currently represented by DB Sports Tours is another young star currently playing in England for West Bromwich Albion, a club who in recent years have become known as a hotbed for developing many young stars. In the past Elbouzedi has been capped for the Republic of Ireland in several games, including games against Serbia, Switzerland and Estonia. Jonathan ‘Jay’ Lunney meanwhile is another DB Sports named in the Republic of Ireland U17 squad. Lunney, who previously played for Malahide FC now lives and plays in England for Preston North End. Like both Clarke and Leahy, Lunney’s past year has seen his development ascend with pace. Everyone at DB Sports wishes the whole team the best of luck in the upcoming games. For more information on kick off times visit the FAI’s official website.